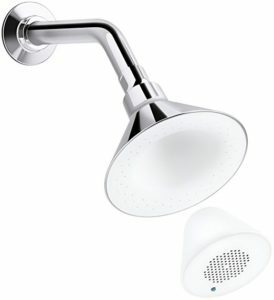 3 Best Shower Heads With Speakers 2017 - Rock Out in the Shower! The shower could be described as the last stronghold against the stresses of the world. It’s where we can lock the door, relax and let it all go at the end of a long day without having to worry about everything on our to do list. It’s also somewhere we can go to heal our aching muscles and pains that can build up. 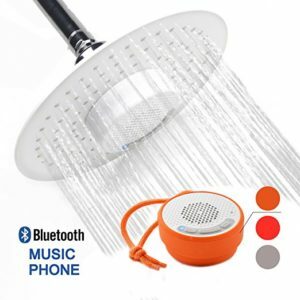 In our guide for the best shower heads with speakers you will find out which shower heads will allow you to listen to music in the shower and completely decompress after a long day! That being said, you will still need a quality shower valve to ensure you get a powerful and consistent shower! Relaxation is the key to a successful shower and with all the latest technology manufacturers are inputting into their designs our shower heads are more functional than ever. We can now choose from 25 different functions and control the water pressure like never before. The latest addition to the top shower heads is the in built speaker. We all love singing in the shower and a lot of us love to listen to music in the shower but it’s generally impractical. Electronic devices don’t do well in wet, humid rooms and they can be damaged. Plus the sound doesn’t always carry into the shower cubicle very well. Now speakers are being built right into the shower head itself. This lets us hear our favourite tunes while we chill out like never before and is taking showering to the next level. There are currently quite a few different brands making shower heads with speakers but we’ve identified our top 3 to make it easier for you. YOO.MEE are a well known name in the shower head industry so it’s no surprise that they’ve developed a showerhead with inbuilt speakers. They’re also known for their innovation and quality so it’s no surprise they’ve made it into our top 3. 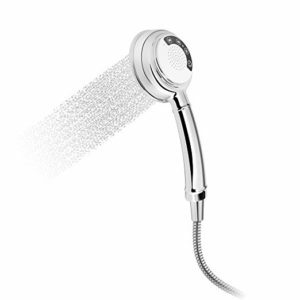 The YOO.MEE Music shower head is made with all the usual functions you’d expect from a modern shower head. It also has a waterproof sound system right at the centre with a bluetooth connection. This let’s is connect to your favourite devices, including laptops and phones, and broadcast your favourite music, radio or even audiobooks while you shower. YOO.MEE have designed and created hundreds of high performing shower varieties and this is no different. Made to give consistently even pressure the shower allows you to relax, unwind and ease your body after a long day. The speakers are fully waterproof and have a good sound quality while you listen. You can connect to a lot of different devices including your phone, and the there is also an inbuilt microphone. This allows you to answer phone calls while in the shower which can be a useful thing. Able to play sound for up to 15 hours continuously the lithium battery has a very long lasting charge. The device is rechargeable meaning you won’t have to have a continuous stream of batteries on hand. Designed to be easy to setup and install the YOO.MEE showerhead is pretty simple to fit and won’t need much maintenance. The chrome makes it a breeze to clean and the speaker system is fast to recharge. YOO.MEE have done a really great job of creating a shower system with great speakers that offer next level showering. With all the classic benefits of a YOO.MEE shower you can get clean in peace with a unit that looks great in any home. H2oVibe are another well known brand for their good quality shower heads. Their products are already in thousands of homes offering some innovative features that enhance your showering experience. 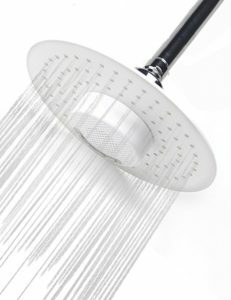 The H2oVibe Rain Showerhead is a fixed overhead mounted shower system that has all of these benefits built in, but also features a sound system at the centre of the nozzles. This connects to devices using bluetooth and allows you to play music, radio or even stories from various devices. 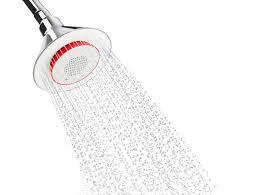 The H2oVibe Rain Showerhead features a very wide base with spread out nozzles. This gives the feel of warm rain which evenly distributes and eases any tension in your body. There is 3 times more spray power than in a standard shower unit ensuring the best possible experience for the user. The sound quality of the H2oVibe showerhead is one of the best around and offers crisp clear listening while you’re in the shower. This premium sound quality will make it seem like you’re listening on any other device with a steady bluetooth connection keeping the music playing. The bluetooth connection allows you to connect to your phone or other devices which can accept calls. H2oVibe have built in not one but two speakers so that you can confidently answer any calls and have a full conversation with no trouble at all. You can just push to speak with no fuss. The H2oVibe is one of the best designed showers with speakers that we’ve seen. The dual microphone let’s you talk in the shower, or sing if that’s your thing, without any problem meaning it’s a really useful system. 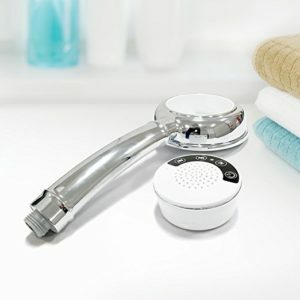 H2oVibe delivers all this without any dip in their standard showerhead quality so whether you love listening to spa music as you relax or a new audiobook you’ll be able to shower with confidence. Everyone has heard of Kohler and knows the quality of products they produce for the home. Kohler have a number of top shower heads available online each built with unique features to benefit the customer. This is the reason why their products always receive such positive feedback from reviews. 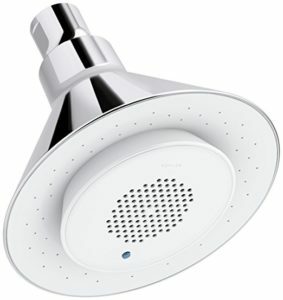 Kohler have not taken any shortcuts in creating their showerhead with wireless speaker attachment. The speaker system connects with a micro USB cable so you can remove it and charge it up again easily. You can then click it back into place in the mounted shower unit and start playing. The speaker attachment in the Kohler shower produces high quality sound that is clear even as the water rains down upon you. It’s perfect for listening to relaxing spa sounds or the latest releases and the bluetooth connection is steady. Unlike the other shower heads Kohler uses a detachable speaker system in their shower. This is easy to fit and remove and makes charging simple. Plus it has the added benefit that it can be used in any other room and still connect to devices. The whole shower head is very lightweight and easy to fit. The speaker system is fully waterproofed and can be clicked into place making the whole unit simple to get going. Kohler stand by their product by offering a lifetime warranty on the shower head. This means you can enjoy your showering and music with peace of mind that if anything does go wrong you’re covered. Overall Kohler have made a really useful and practical shower head that lets you listen to all your favourite tunes while you shower. It allows you to take your relaxation to the next level, but also take the sound system with you when you’re done which makes it remarkably useful. With a stylish exterior and a long battery life Kohler have combined fashion with practicality and have made a shower that is remarkably good at what is does. Listening to music in the shower is the next step and sooner or later we’ll all be doing it. All three of these brands are well established shower head manufacturers and they’ve used their expertise to create showerhead speaker systems that are really effective. All of these units are slightly different but they each offer great showering with good quality sound systems and built in microphones. So whether you love listening to the news, books or just the latest hits, these are definitely three shower heads to look at! If you are interested in regular shower heads we have reviews for the best rain fall shower heads for low water pressure, and the best metal hand held shower heads!